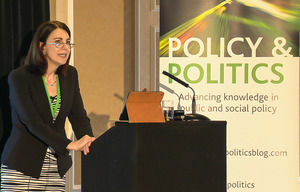 Professor Helen Sullivan delivers keynote address at policy and politics conference, bristol, uk . Professor Helen Sullivan delivered a keynote address at this year’s Policy and Politics Conference, Bristol, UK (16-17th Sept). Helen spoke on the theme of Collaboration as ‘the new normal’ – Global trends, public policy and everyday practices. Her lecture offered a different perspective on the role of collaboration in public governance and public management, emphasising the necessity of thinking more expansively about the places and spaces of collaboration to build new knowledge. She argued for the need to develop better frameworks for understanding collaboration, focusing on the political, material and culture spheres of collaboration, and the significance of a number of undermined elements including ethics, emotions, expertise and practices. The lecture concluded by identifying a range of challenges arising for policy makers, policy analysts and practitioners of working in this way. Watch Professor Helen Sullivan’s keynote address on the Policy and Politics Journal Blog.